These lovely and spacious thatched villas are available in four different variants. There are three 6-person types: a wellness villa (NL-1787-16), a wellness deluxe villa (NL-1787-19) and a wellness villa with a jacuzzi in the garden (NL-1787-20). There is also an 8-person type (NL-1787-17). 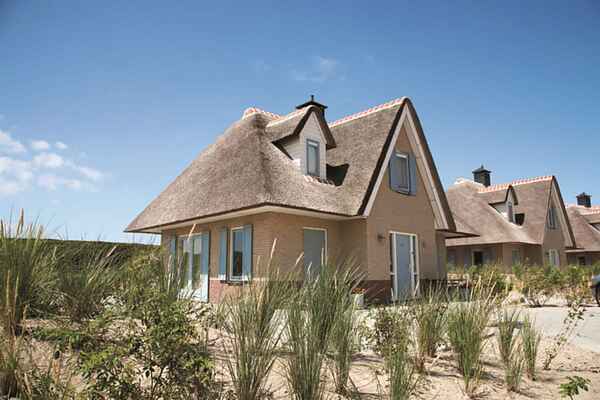 The villas are furnished in a charming ambience and are spread throughout the small-scale Duynzicht holiday park. All the villas have a sauna and a garden with a terrace, and most come with garden furniture. A luxurious destination for anyone who loves their comfort, and just 500 metres from the beach.